This morning in Huntington at 8:00AM it’s currently -8 degrees under mostly clear skies. Winds are calm here at ground level, but I can see the clouds cruising southward above the mountain. Relative humidity is 81%, dewpoint -12, barometric pressure 30.19” and rising. We picked up a total of 8.25 fluffy inches from the storm and have 17” at the stake. Yesterday’s high was 29, and the overnight low was -8. A Wind Chill Advisory remains in effect for our region until 1:00PM this afternoon. With chilly high pressure building into region this morning, any morning clouds should give way to clearing skies. Temperatures will only make it to around 5 above today with northwest winds 10 to 15 mph gusting up to 25 mph. Wind chill values could be as low as -31 below so bundle up if heading out to enjoy the powder! Tonight should be partly cloudy until midnight, then cloudy with a 20% chance of snow showers after midnight a low approaches and skirts to our south. It’ll be cold with lows around -3 below with northwest winds 10 to 15 mph. Sunday should be mostly cloudy with a 20% chance of snow showers in the morning as the low moves by. Highs will be around 8 above with northwest winds 10 to 15 mph. Wind chill values could be as low as -21 below. Sunday night should be mostly cloudy and even colder with lows around -13 below with northeast winds around 10 mph. Wind chill values could be as low as -25 below. Monday’s looking cloudy with a 50% chance of snow as another low approaches from the Ohio River Valley. Highs will top out at around 1 above with north winds around 10 mph. Monday night should be partly cloudy with lows -15 below to -20 below zero. At this point it’s looking like temperatures will remain well below normal for most of the week with the exception of a brief bump into the 20s on Wednesday. Last year on this date we had a high of 33 and a low of 17. We had 5.5″ of snow on the ground. Burlington norms for this date are highs of 28 and lows of 10. The record high was 56°F in 1988. The record low was -27°F in 1920. Tomorrow will be 2m30s longer. The Moon is waxen gibbous, 11 days old with 89% illumination. 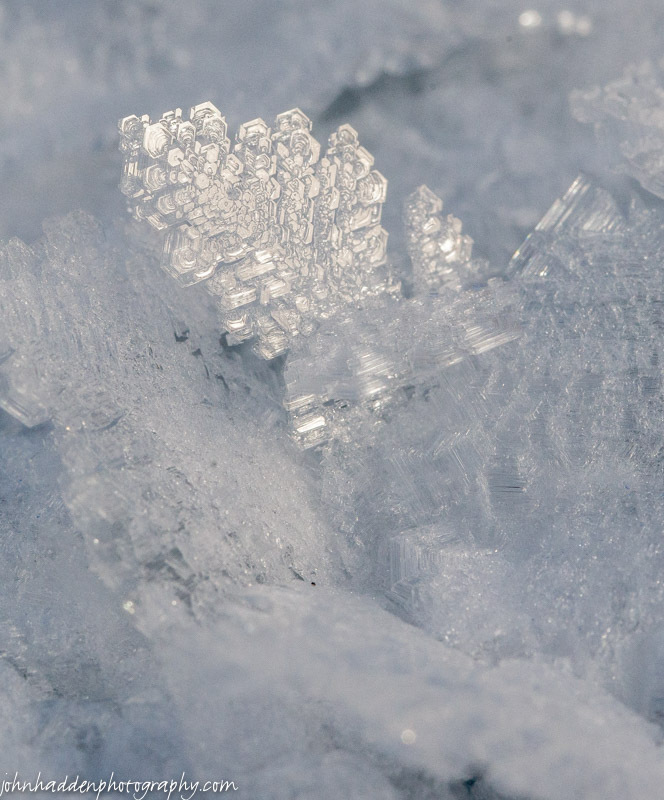 A macro lens pulls in some fine detail to hoarfrost crystals growing on the pond. Nikon D600, Sigma 105mm macro lens, ISO 800, f/18, 1/640″ exposure. This morning in Huntington at 6:55AM it’s currently a balmy 27 degrees and snowing lightly under overcast skies. Winds are calm. Relative humidity is 93%, dewpoint 25, barometric pressure 29.82”. We picked up 2.5” of fluffy snow overnight and have 13.5” at the stake. Yesterday’s high bumped up to 34, and the overnight low was 25. The Winter Weather Advisory remains in effect for our region until 1:00AM Saturday, and Wind Chill Advisory is in effect from 7:00PM tonight until 1:00PM Saturday. The clipper system is currently over the St. Lawrence valley and southern Québec and will continue to produce snow throughout the day today. It will move off the New England coast this evening and redevelop allowing for a northwest airflow to bring in some wrap-around upslope snow showers the ‘Dacks and northern Greens though the evening. Bitterly cold air will move in behind the departing front along with gusty northwest winds setting the stage for a frigid weekend. We’ll see snow today with additional snow accumulations of 3 to 5 inches during the daylight hours. Highs will top out early in the upper 20s with southwest winds around 10 mph, becoming northwesterly with gusts up to 25 mph this afternoon. Temperatures will begin to drop as the front moves by this afternoon. Chance of snow near is 100%. Tonight should be cloudy with snow showers likely, mainly until midnight. We should expect total snow accumulation of 4 to 8 inches. It’ll be much colder with lows around -6 below with northwest winds 15 to 20 mph gusting up to 30 mph. Chance of snow is 70%. Wind chill values could be as low as -25 below. Saturday should be partly sunny and cold with highs only around 4 above with northwest winds 10 to 15 mph gusting up to 25 mph. Wind chill values could be as low as -28 below. Saturday night should be partly cloudy and cold with lows around -4 below with west winds around 10 mph. Sunday’s looking partly sunny and remaining cold with highs around 8 above and northwest winds 10 to 15 mph. Wind chill values could be as low as -20 below. Sunday night should be partly cloudy with lows -15 below to -20 below zero. Last year on this date we had a high of 27 and a low of 1. We had 5.5″ of snow on the ground. Burlington norms for this date are highs of 28 (up a degree!) and lows of 10. The record high was 57°F in 2013 (we had a high of 59). The record low was -20°F in 1948. Tomorrow will be 2m29s longer. The Moon waxing gibbous, 9d 23h old with 82% illumination. 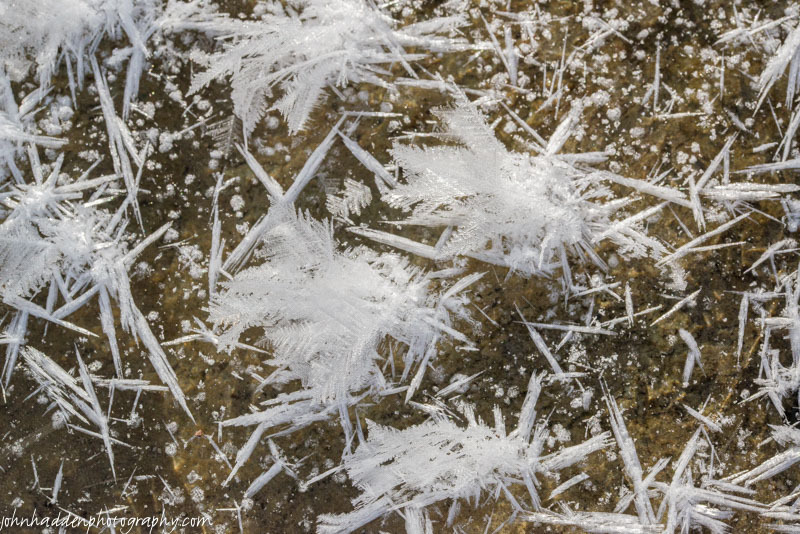 The open water in Fargo Brook creates fanciful hoarfrost crystals on cold mornings. This morning in Huntington at 7:15AM it’s currently -6 degrees under mostly clear skies. Winds are calm. Relative humidity is 87%, dewpoint -9, barometric pressure 30.36” and steady. We have 12” of snow at the stake. Yesterday’s high was 17, and the overnight low was -6. There is a Winter Weather Advisory in effect from 7:00PM this evening to 1:00AM Saturday. A clipper system out over the Great Lakes will move into our region this evening bringing some snow. We’ll see mostly sunny skies this morning becoming mostly cloudy later in the day. Temperatures will climb quickly today into the upper 20s on a southerly airflow out ahead of the approaching clipper. Winds will be light and variable winds, becoming southerly at 10 to 15 mph and gusting up to 25 mph this afternoon. Tonight the snow will move in. Expect snow accumulations of 1 to 3 inches overnight. Lows will be in the lower 20s with south winds 15 to 20 mph gusting up to 30 mph. Chance of snow is 90%. Snow will continue into Friday with additional snow accumulations of 2 to 4 inches. Highs will be in the upper 20s with temperatures falling to around 17 in the afternoon as another surge of arctic cold moves in. Winds will be out of the southwest at around 10 mph, becoming northwesterly with gusts up to 25 mph in the afternoon. Chance of snow is 90%. Snow will linger into Friday night with additional light snow accumulations possible. It’ll turn much colder with lows around -6 below with northwest winds 15 to 20 mph gusting up to 30 mph. Chance of snow is 70%. Saturday’s looking mostly sunny and cold with highs only around 4 above with northwest winds 15 to 20 mph. Saturday night should be partly cloudy with lows -5 below to -10 below zero. Last year on this date we had a high of 19 and a low of -6. We had 5.5″ on the ground. Burlington norms for this date are highs of 27 and lows of 10 (still). The record high was 49°F in 1950. The record low was -18°F in 1954. Tomorrow will be 2m25s longer. The Moon is waxing gibbous, 8d 23h old with 74% illumination. 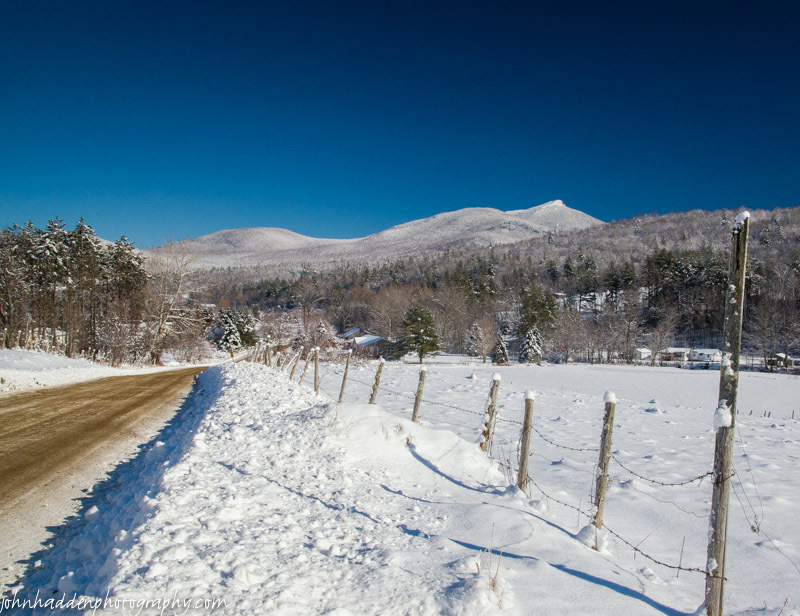 Shaker Mountain Road offers some lovely views of Camel’s Hump. Clear bluebird skies make for a lovely panorama! This morning in Huntington at 6:15AM it’s currently 4 degrees under overcast skies. Winds are light and variable. Relative humidity is 84%, dewpoint 0, barometric pressure 30.07” and rising rapidly. We picked up a measurable total of 3.5” for the storm total, though with the lightness of the snow and the all the blowing, it’s hard to say just how much fell. We have 12.75” at the stake. Yesterday’s high was 10, and the overnight low was 4. The nor’easter is moving off the coast of Nova Scotia this morning. We’ll see cloudy skies with a 20% chance of light lingering snow showers this morning, then partly sunny skies this afternoon as high pressure builds in. Highs will be around 14 with north winds 10 to 15 mph. Tonight should be clear and cold with lows around -4 below with light and variable winds. Thursday should be partly sunny in the morning, then mostly cloudy milder with a slight chance of snow in the afternoon as a clipper system heads our way from the Great Lakes. Highs will be in the upper 20s with light and variable winds, becoming southerly around 10 mph and gusting up to 25 mph in the afternoon. Chance of snow is 20%. Thursday night should bring snow with light snow accumulations possible. Lows will be in the lower 20s with south winds 10 to 15 mph gusting up to 30 mph. Chance of snow is 90%. Snow will continue into Friday morning with additional light snow accumulations possible. We may see 3-4″ total out of this clipper by Friday midday. Stay tuned. Highs will be in the mid 20s with temperatures falling to around 15 in the afternoon on west winds 10 to 15 mph gusting up to 25 mph. Chance of snow is 90%. Friday night should be partly cloudy with a 40% chance of lingering snow. It’ll be much colder with lows around -10 below. Last year on this date we had a high of 16 and a low of -7. We had 5.5″ of snow on the ground. The record high was 56°F in 1916. The record low was -26°F in 1925. Tomorrow will be 2m24s longer. The Moon is waxing gibbous, 7d 22h old with 64% illumination. This morning in Huntington at 6:10AM it’s currently 5 degrees under overcast skies. Winds are out of the southwest at 0-4 mph. Relative humidity is 84%, dewpoint 1, barometric pressure 29.97” and falling. We have 9.5” of snow at the stake. Yesterday’s high was 17, and the overnight low was 6. Morning radar imagery shows the nor’easter slowly edging our way on a line roughly from Albany to Lancaster, NH. Looks like snow is just starting to creep into the Barre area. The coastal low is currently centered off the New England coast near Nantucket and is deepening impressively as barometric pressure is dropping quickly. But while places like New York City and Boston might be getting hammered this morning, forecasts are indicating that heavy snow will have a hard time making it into our region as the cold air and low relative humidity we serve to block the westward progress of the storm. We will see some snow though starting mid-morning most likely and continuing throughout the day. Highs will be around 12 with north winds 10 to 15 mph. Chance of snow is near 100%. Tonight should be cloudy with snow tapering off around midnight. We should expect snow accumulations of 2 to 4 inches here in Huntington with lesser amounts in the Champlain Valley and west and north. Lows will be around 6 above with north winds 10 to 15 mph. Chance of snow is 70%. High pressure will build back in Wednesday and we’ll see cloudy skies with a 20% chance of snow in the morning, then partly sunny skies in the afternoon. Highs will be around 16 with north winds around 10 mph. Wednesday night should be mostly clear with lows -2 below to 4 above zero with light and variable winds. Thursday’s looking mostly cloudy and milder with highs in the upper 20s and south winds around 10 mph. A clipper system will slide our way from the Great Lakes on Thursday night bringing snow with light snow accumulations possible. Lows will be around 20. Chance of snow is 70%. Last year on this date we had a high of 38 and a low of 4. We had 5.5″ of snow at the stake. Burlington norms for this date are highs of 27 and lows of 10. The record high was 53°F in 1996. The record low was -29°F in 1994. Tomorrow will be 2m22s longer. The Moon is just past its first quarter, 6d 22h old with 53% illumination. One more shot of interesting hoarfrost crystals on Fargo Brook. Here there’s a combination of long, fingerlike crystals along with fluffier feathers riding atop. This morning in Huntington at 6:15AM it’s currently -10 degrees under clear skies. Winds are calm. Relative humidity is 85%, dewpoint -13, barometric pressure 30.18” and rising slowly. We have 9.5” of snow at the stake. Yesterday’s high was 30 (at 6:00AM), and the overnight low was -10. Today we’ll see partly cloudy skies this morning with more clouds for this afternoon. 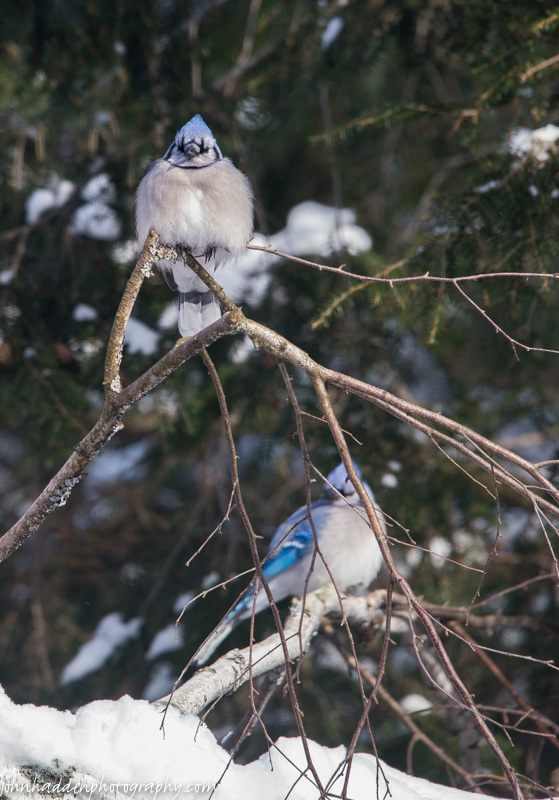 High will be around 19F with light and variable winds. Tonight should be mostly cloudy with a few flurries or snow showers possible. Lows will be around 9F with north-northeast winds at 5 to 10 mph. Tuesday snow is likely. Highs will be around 13F with north winds at 10 to 20 mph. While there are Winter Storm Warnings currently in effect for Rutland, Windsor and Orange counties, and Winter Weather Advisories in effect for Addison, Washington, Caledonia and Essex counties in Vermont, the cold air that’s currently in place in our area will make it difficult the storm to push this far north. That being said, the NWS is predicting 2-5” in the Champlain Valley during the day Tuesday with increasing higher totals south and east. The snow will taper off Tuesday night from west to east. Overnight lows will be around 7F with north-northwest winds at 10 to 15 mph. Chance of snow is 50%. Surface high pressure will build back in Wednesday bringing partly to mostly cloudy skies. Highs will be around 16F with northwest winds at 5 to 10 mph. Wednesday night should be mostly clear with lows around 6F and light and variable winds. Last year on this date we had a high of 19 and a low of -7. We picked up 1.75″ of snow and had 6″ at the stake. The record high was 55°F in 1950. The record low was -25°F in 1994. Tomorrow will be 2m18s longer. The Moon is a waxing crescent, 5d 22h old with 42% illumination. 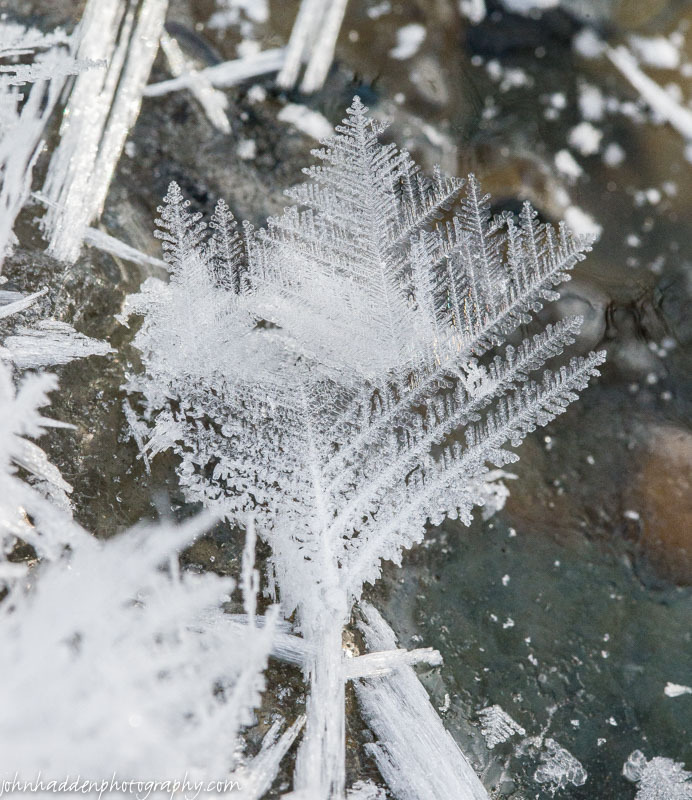 Getting in close with a macro lens reveals beautiful structure in a fernlike hoarfrost crystal on the ice of Fargo Brook. This morning in Huntington at 8:00AM it’s currently 18 degrees under partly cloudy skies. Winds are out of the west at 0-4 mph. Relative humidity is 85%, dewpoint 14, barometric pressure 29.61” and rising rapidly. We picked up a 1” dusting of snow overnight and have 9.75” at the stake. Yesterday’s high was 37, and the overnight low was 18. Cold Canadian high pressure is currently building into the region and will dominate our weather through tomorrow. We’ll see cloudy skies with scattered snow showers this morning. Daytime highs will top out at around 20 this morning then fall to around 6 above by this afternoon. Winds will be out to the northwest winds 20 to 25 mph, diminishing to 10 to 15 mph this afternoon. Chance of snow is 50%. Tonight should be partly cloudy and colder with lows around -7 below and northwest winds around 10 mph until midnight, becoming light and variable. Monday should be partly sunny with highs around 12 and light and variable winds. Monday night should be cloudy with a 40% chance of snow showers. It’ll be cold with lows around zero with light and variable winds. Another coastal storm is looking to head our way on Tuesday bringing snow with moderate accumulations possible. Stay tuned… Highs will be around 13 with north winds 10 to 15 mph gusting up to 30 mph. Chance of snow is 70%. Tuesday night should be cloudy with a 50% chance of snow. Lows will be around 5 above. Last year on this date we had a high of 22 and low of 14. We had 4.5″ of snow at the stake. The record high was 55°F in 1938. The record low was -19°F in 1912. The Moon is a waxing crescent, 5 days old with 32% illumination. 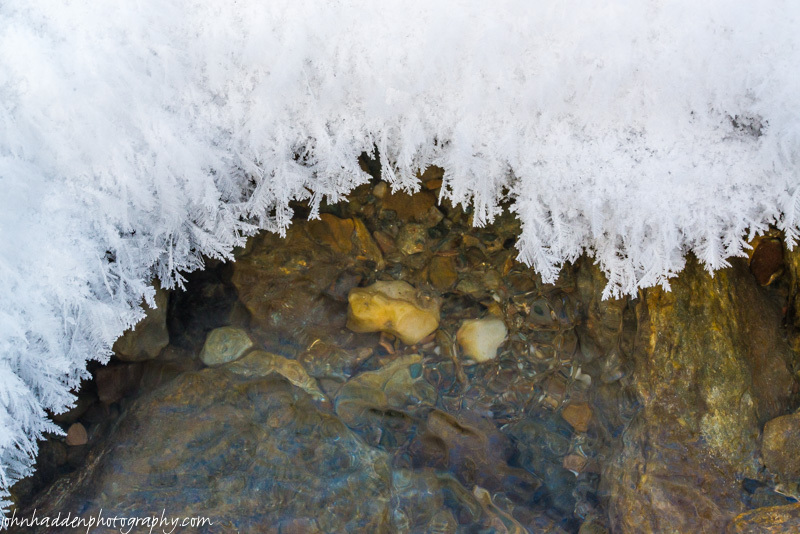 The open water on Fargo Brook adds just the right amount of moisture to create wonderfully fanciful hoarfrost crystals in its sheltered crannies. 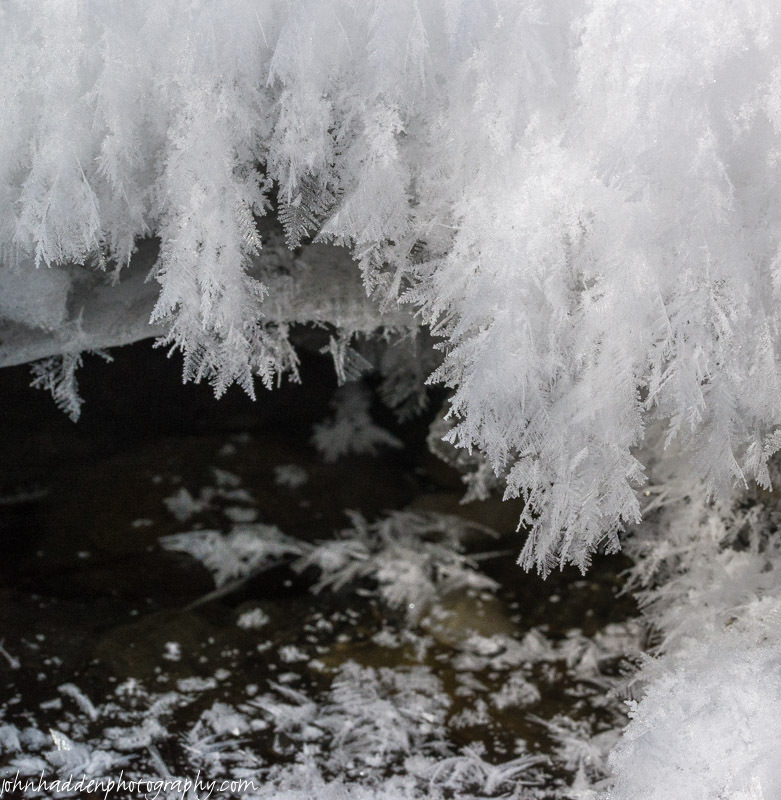 These crystals pile and droop like beards or feathery stalactites in their pancake ice caves.